The Neighborhood Watch Program is a successful effort that has been in effect for over thirty years in towns, cities and rural areas across the country. Based on the concept of cooperation, neighborhood watch programs bring together law enforcement, city officials and residents, and ask them to work together to provide protection for their homes and communities. Crimes such as burglary, vandalism and criminal mischief threaten every member of each community and crime watch efforts such as The Neighborhood Watch Program help discourage this type of activity. Also called Crime Watch, Block Watch, or Community Watch, the program’s success is based on the commitment of the public and their local police department to work together to observe, report and dissuade crime in their communities. Residents not only take care of their own homes and businesses, but also those of their neighbors. By taking an active role in the protection of their families and possessions, residents are better able to discourage criminal activity and keep their neighborhoods safe. 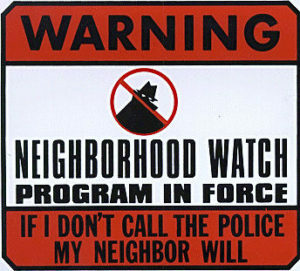 There are thousands of neighborhood watch programs across the United States in which citizens work together to make their homes and communities less inviting targets for crime. The program is considered by many to be one of the most successful ways in which the members of various communities can help one another to reduce residential crime. Active participation among the public and local law enforcement is an essential element in a successful neighborhood watch program.